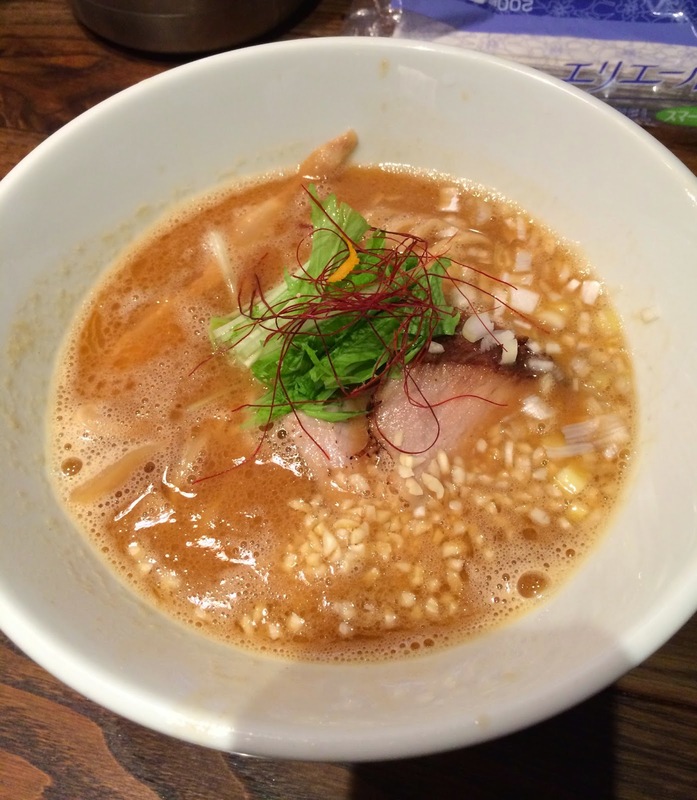 To have a late lunch, I went to a ramen shop called Shinjuku Momonga. Momonga means a flying squirrel. 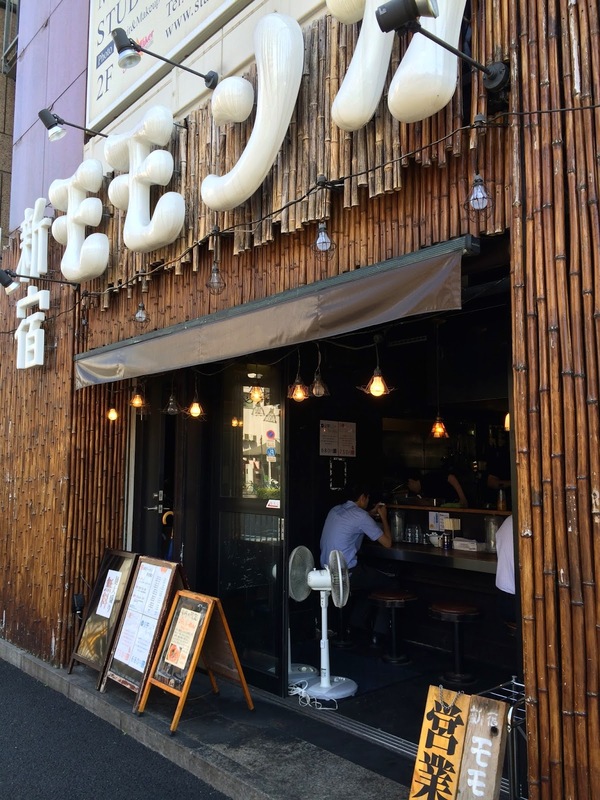 They're famous for Ebi Ramen, and Ebi means shrimp in Japanese. I got there around 1:15 PM and about a half of the counter with 15 chairs was open. 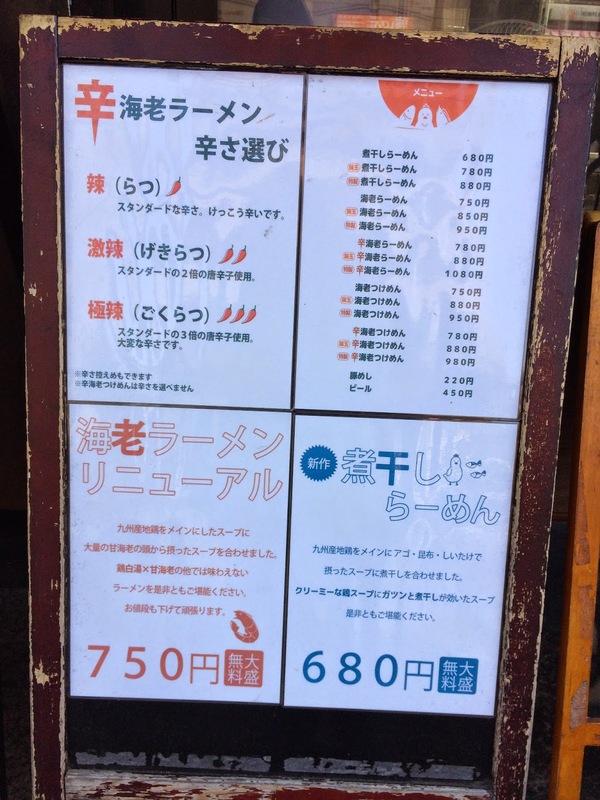 I bought a ticket of Ebi Ramen from a vending machine and sat at one of the chairs. 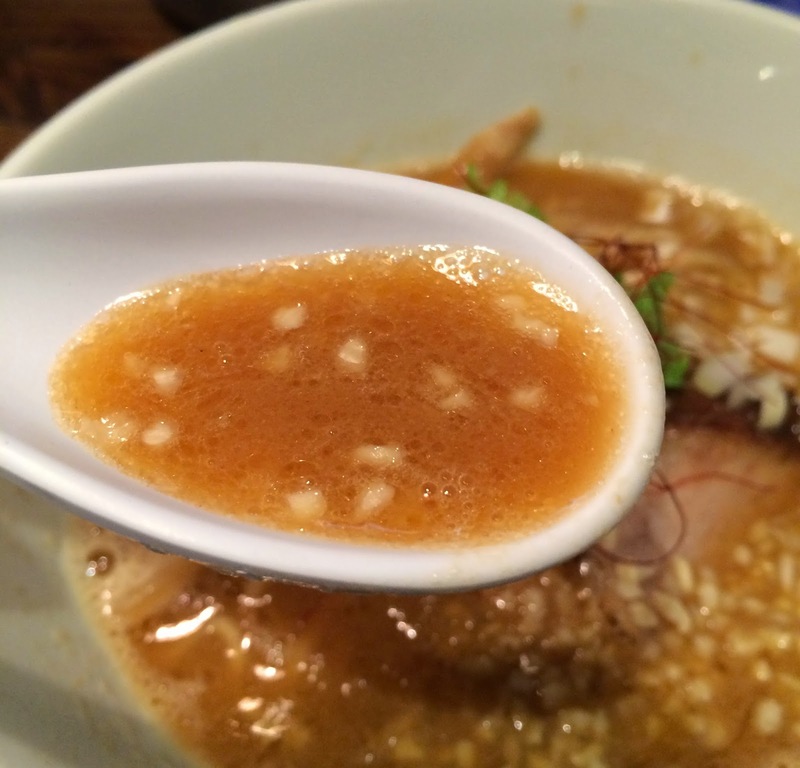 Ebi Ramen uses Paitan, chicken-bone soup, mixed with dashi from heads of deep-water shrimps (pandalus borealis). 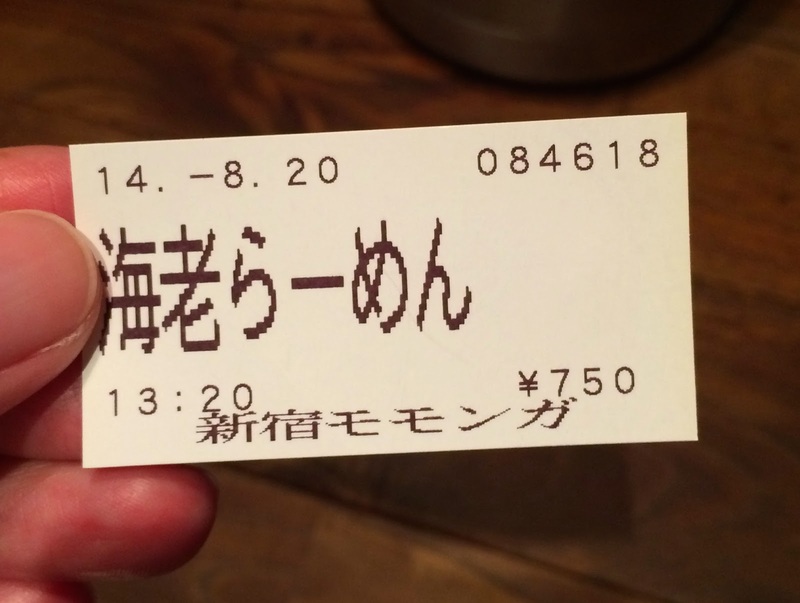 When I put this ticket on the counter, a mid-age guy offered me extra noodles for free, but I said no thank you. Within a minute, another young guy asked me, "Extra noodles?" They started heating up some soup to order and soon my ramen was brought. But the employee didn't say anything but, "Here" without "Thank you for waiting" or "Enjoy." Ebi Ramen had 2 slices of char siu, chopped leeks, nuts, Mizuna (Japanese mustard), mianma, red pepper stings and a piece of tangerine zest. In the soup, there're diced nuts which seemed like peanuts, and they're adding some flavor and different texture from Naganegi onions. The soup was very thick as it's Paitan and had very strong shrimp flavor. The shrimp flavor was so strong as if I was chewing the head. Noodles were thick and slightly wavy, and I saw some dots in the noodles, so I think it's whole wheat. They're chewy and cooked al dente. As they're thick and wavy, rich and creamy soup were well caught. 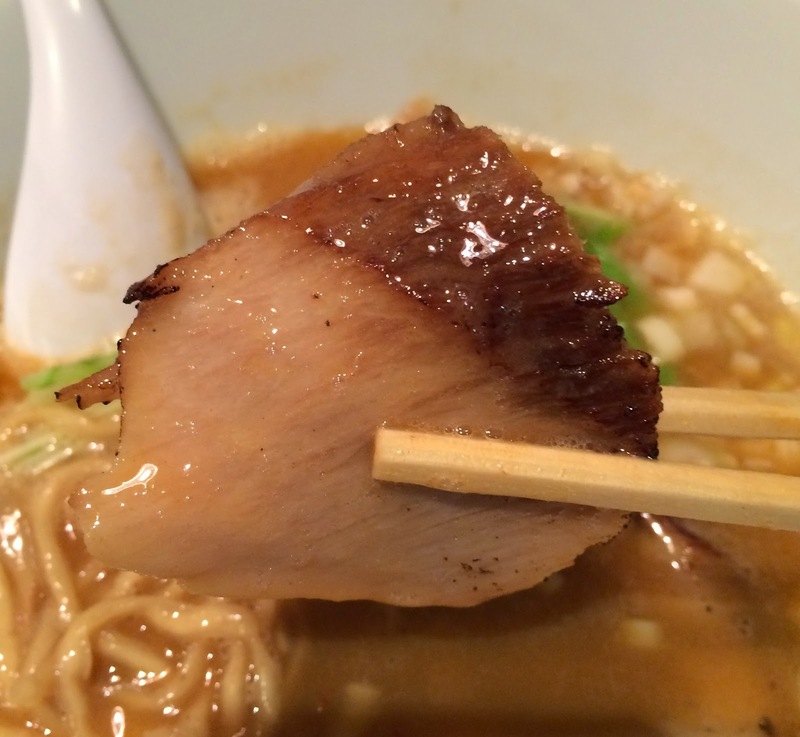 Both char siu were broiled before they serve, and they had some fragrant but not burnt scent. They're very soft and broke apart once I put in my mouth. They're seasoned well but not too much or not too salty. And no fatty part was contained. I finished most of the soup and the deeper I scooped, the rougher the soup got. There're a lot of black pebbles like sand, and they looked like shells or inners of shrimps. So far, I was happy about this ramen, but I didn't enjoy the shop at all. First I wasn't happy about being asked same question twice that means they don't pay attention what other employees were doing. Young employees were mumbling to customers, "thank you" reluctantly and no "welcome," but they're so cheerful when they're talking to each other. The worst thing I couldn't stand for was one of the young employees sneezed in the kitchen but he didn't cover his nose or mouth. For various reasons, not going back there again. 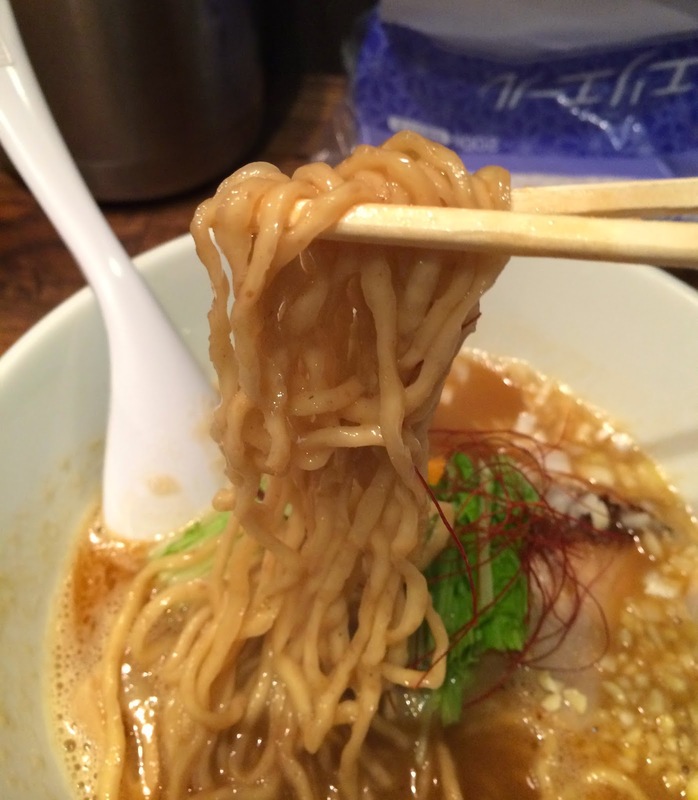 I've reviewed the following Ramen shops.